The HSM SECURIO B34 HS-5 is an 0.78X11mm Crypto Cut shredder. It is a stylish new high security, power efficient shredder suitable for use in Offices requiring to shred paper documents that are of the highest importance. The HSM SECURIO B34 HS-5 High Security shredder comes complete with a special Energy Management Control System (EMCS) that switches the machine into Energy Save mode automatically whilst operating all functions with one single control key. 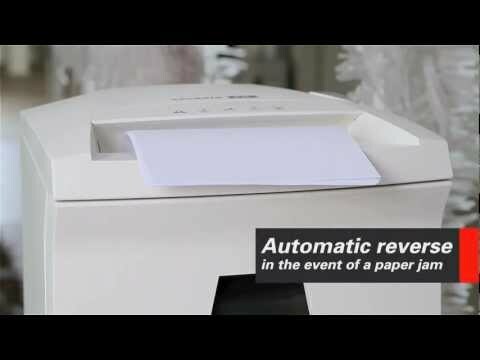 In the event of a paper jam, the HSM SECURIO B34 HS-5 High Security machine kicks into reverse automatically, saving operator time and effort. Alternatively, you can press the "R" button if you wish to operate the reversing function manually. Features of the HSM SECURIO B34 HS-5 High Security machine include an exceptionally quiet running motor for use in busy offices, a transparent front window allowing quick and easy viewing of container shredded waste capacity and level and a large waste container to extend the interval between emptying, saving time and money. The HSM SECURIO B34 HS-5 High Security shredder automatically switches to energy-saving mode 2 minutes after use and automatically switches on again if paper is placed in the entry throat. If not used for 4 hours the machine switches off completely eliminating all power consumption. The use of a P-6 shredder such as the SECURIO B34 HS-5 - Ex Showroom will aid your GDPR compliance.